Fun and games in the attic. 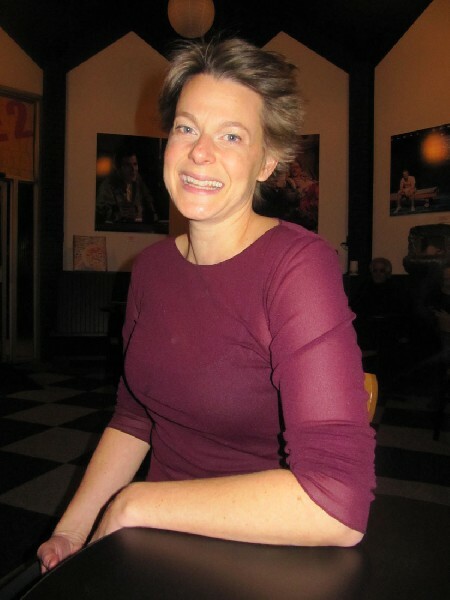 This is the second season for WAM Theatre under artistic director Kristen van Ginhoven. Giuliano photo. 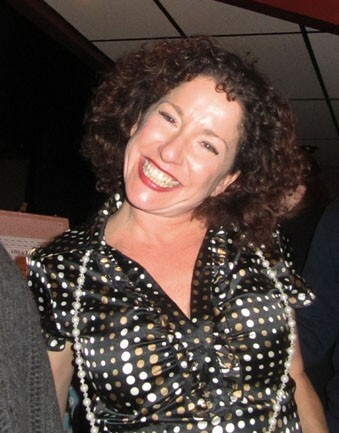 Karen Lee as Jell has a brilliant comedic touch. Giuliano photo. Scenic Design, Juliana von Haubrich; Lighting Design, Jeff Roudabush and Nick Webb; Sound Design, Brad Berridge; Costume Consultant, Arthur Oliver; Fight Choreography, Ryan Winkles. 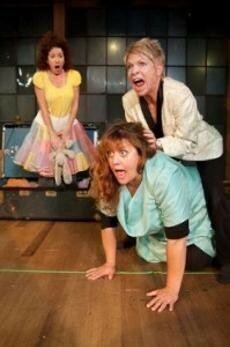 Cast: Barbara Cardillo (Jojo), Deann Simmons Halper (Jayne), Karen Lee (Jelly). The Sisters Fine, the eldest Jojo (Barbara Cardillo) a professor, Jayne (Deann Simmons Halper) an executive in mergers and acquisitions, and the youngest Jelly (Karen Lee) an installation artist, have gathered in the family home on the occasion of the death of their father. Their mother had passed away previously. What about that sounds familiar? Three sisters? Funeral? In a chaotic play by a committee of authors- Jennifer Brewin, Leah Cherniak, Ann-Marie MacDonald, Alisa Palmer and Marta Ross- The Attic, The Pearls & Three Fine Girls hovers somewhere between drama/ tragedy and comedy/ farce. We were well into the ninety minute, one act play not knowing whether to laugh or cry. The first laughs seemed perhaps to be a mistake. Nervous titters. But the action on stage under the direction of Kristen van Ginhoven got ever more frenetic. With flat out gonzo mayhem the three women were chasing each other all over the multi-layered set neatly designed by Juliana von Haubrich to include an attic and below that a living room and kitchen with entrances off of them. For a company only in its second season with leased spaces the production values were well above the norm for community theatre. In a relatively short time WAM has sent shock waves through the Berkshire theatre community. Particularly its unique agenda of providing a portion of ticket sales to charities in support of women. In this production, the charity is The Berkshire United Way Teen Pregnancy Prevention Initiative. The play begins in the attic. Jojo and Jayne are sorting through stuff that evokes vivid childhood memories. Jayne puts on the “torture dress.” We never quite learn what that means or how it was used. There is a human voice coming from a large trunk. After some sisterly conspiracy, clearly played out over their childhood years, they tease and torment the person in the box. Boxes, it seems, are an important theme and inspiration in the work of the performance artist Jelly who emerges from confinement. When at last we see the three sisters, we wonder what the heck is going on here? Visually they are so mismatched there is no way they are genetically connected. Jayne is tall, thin, has a buzz cut shock of fashionable blonde hair. She evokes big time, tough as nails, big city panache. Jojo is heavy set with nondescript hair and a thrift shop fashion sensibility. The youngest Jelly is short and perky with a feisty artsy vibe. There you have it. Three sisters who could not be less alike. Nature or nurture? Take your pick. The dichotomy between disparity and commonality, sisterhood is powerful, is the roller coaster that will rocket us through a topsy turvy evening of theatre. So much is, shall we say, sitcom predictable. Jayne, constantly on the phone to lovers, clients and associates doesn’t have time for all this. Even for dear old Dad. Whatever. Jelly has moved back in with Dad, from her squalid little apartment, to care for him in his final illness. Mostly, as the other sisters observe, because she had lots of free time. She’s an artist. That got a laugh. Jojo and Jayne banter on the theme of what’s an artist? Jayne wants to know how you make a living on installation art. Jelly has a show pending in Munich. We see some of the work. Seems that Dad left Jelly the house. Well, that’s ok. It’s not much of a house. Jojo and Jayne figure that they will get say $25,000 each. Jojo plans to return to India. She only came home to be with Jayne through one of her ersatz bouts of near death illness. She can bring on a seizure at the drop of a hat. What money? Jelly under duress produces a bank book with like $75. Cut three ways that’s an inheritance of $25 each. Plus the house. Dear old Dad stipulated that he wanted a party one week from his demise. That occupies what remains of the play. The motley crew of guests, welcome and not, are a shadowy presence. Including Jojo’s ex who, natch, Jayne is screwing. While the party is going on the sisters are up in the attic chasing each other with knives and stuff like that. Seems Jayne is also gay. Or bi or whatever. She outs herself. Presented with this revelation, Jojo responds that she should be gay. But she’s too old so it’s too late for that. Were she a lesbian she would have tenure by now. Sad but true. One of the best lines of the evening. The characters were spinning around so frantically that we never really got to know or believe them. Mostly they were shouting at each other. Not feeling or reacting to the pain. Often Jayne and Jojo respond simultaneously to Jelly. That doesn’t happen in real life which, like lightning, never strikes twice in the same spot. The second and third time it just got annoying. Of the three actors I only believed and trusted Karen Lee as Jelly. She seemed to slow down and settle into her character which conveyed nuanced dimension. The other two women just crashed into and collided in accordance with the uncertainty principle. Stepping back a moment, what we never really felt is a familiar dynamic. Why is it in families that one child takes on the thankless role of care provider? Who are then rewarded with more that an equal share. Or, in some tragedies, receive less inheritance than those who do little or nothing for aging parents. A bit of King Lear anyone? When going through the stuff in the attic, Jelly says you can have this or that. She is rebuked sharply. Jojo reminds her that it is not her’s to give. It belongs to all of them. The commonality that ultimately trumps disparities. The stuff of drama and tragedy. As well as comedy. If hell is other people that goes double for families. What’s funny about that? Well, see this play and find out.